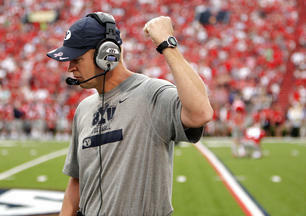 Why does BYU football coach Bronco Mendenhall wear that nylon T-shirt during football games? On national TV, can't he go with a nice golf shirt, white or blue with trim? Heck, some coaches wear bow ties and vests. Inquiring minds wanted to know this week. I got requests to find out why. Well the short answer is that Mendenhall often does things that are symbolic, the deed or object represents something he believes is important.